AUT provides many ways to promote your company’s internship or work placements to students and graduates – we can connect you with our top talent, and boost your company’s profile on campus. Most of our study programmes at AUT include workplace experience for students, which are often compulsory. During a work placement, the employer provides feedback on the student’s performance so that the student can gain academic credit. The length of a placement can vary, and it needs to fit around the student’s programme schedule. Our Employability Relationship managers can guide you in the details, and explain the benefits of a placement for your organisation. Do you have a role that offers a genuine opportunity for an AUT student or graduate to learn and gain valuable experience in a supportive environment? List it on CareerHub, our job board for student and graduate opportunities. Contact our Employability Relationship managers for more information or register directly on CareerHub. AUT Internz is a personalised recruitment service for employers in New Zealand, the USA, Canada, Singapore and the UK to offer new AUT graduates an opportunity to put their learning into action. 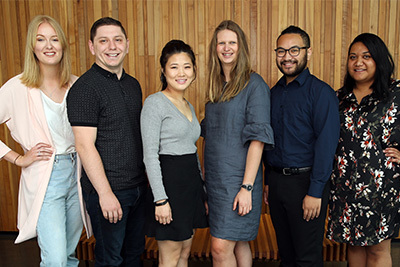 Westpac, Icebreaker, Allbirds, Fonterra and the Sundance Institute are among employers who have welcomed AUT interns. Check the Internz website for full employer information and contact details. We can help you raise your company's profile among AUT students and connect you with AUT's top student and graduate talent.